Another planetary nebula, but a lot smaller looking than the Dumbbell. 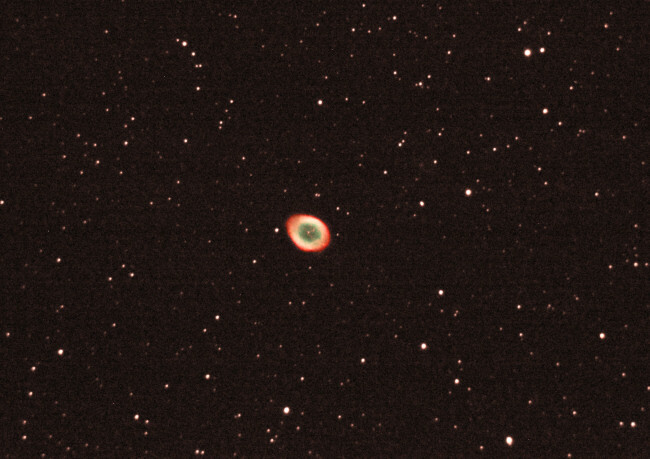 The 'Ring Nebula' (M57) is located in Lyra. Through a telescope it is a little grey ring, but even the humblest camera will bring out some colour. This is just a single 30sec exposure with the Canon. That star in the middle of the ring is the origin of the nebula. That's quite encouraging to a newbie aspiring astrophotographer like me if it's possible to get something with that much colour with just one thirty second shot! It's believed that the ring nebular and the dumbbell nebular are similar in shape and we see the dumbbell from the side and the ring nebular looking straight down the barrel! Modern DSLRs are very sensitive, and putting the ISO on the largest setting will show the 'ring' colours. Good contrast from a fairly dark sky will help, otherwise a light pollution filter is required knocking down the nebula light. Simply 'adding' the light from several exposures helps. Trying to get the 'green', 'yellow' & 'red' colours is a challenge with a DSLR, but it can be done. It never fails to amaze me that the amateur today can obtain images better than the largest telescopes could 60 years ago.